Captain Jack is back in the licensed Pirates of the Caribbean medium jump, to bring adventure and treasure to all that enter this moonwalk! 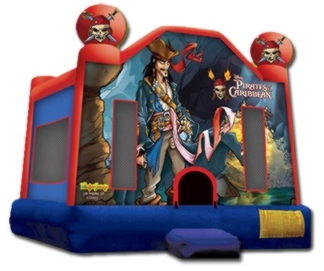 A set of skull and crossbones, the official logo of the pirate, will draw guests in, but the bouncy laughter-filled moonwalk will keep them there. Detailed artwork shows Jack Sparrow, Captain of the Black Pearl, docking his pirate ship at your next event.